Captured by the Japanese soon after the attack on Pearl Harbor, Guam was retaken in 1944, but not easily. UK: A truce is signed between the British Government and the IRA to allow negotiations to take place. The Irish Nationalists want to be an independent Republic, while the British push to create an Irish state under the King. Spain: Day 355 of 985 of the Spanish Civil War. After the failed Nationalist attack at Guadalajara, Spanish Republican troops defending Madrid go on the offensive. China: Japanese troops conduct a night-time exercise near the border of China and Manchukuo. The Japanese fail to tell the Chinese, thus, the Chinese guards think the Japanese troops are invading and begin firing on them. Germany: New Nazi laws prohibit Jews from trading or providing a number of specified commercial services. Spain: Day 720 of 985 of the Spanish Civil War. CBI - China: Day 365 of 2,987 of the 2nd Sino-Japanese War. Day 26 of 139 of the Battle of Wuhan. Germany: The last remaining Jewish enterprises in Germany are closed down. CBI - China: Day 730 of 2,987 of the 2nd Sino-Japanese War. Day 23 of 68 of the Battle of Tianjin. CBI - Mongolia: Day 57 of 129 of the Battle of Khalkhin Gol, a border dispute between the Soviet Union and Japan. Atlantic: Off Norway, German aircraft and minesweepers sink 4 British submarines: HMS NARWHAL, HMS SPEARFISH, HMS SHARK and HMS THAMES. Atlantic: German sub U-34 sinks the Estonian collier VAPPER south of Cape Clear, Ireland. To the south, U-30 sinks the Egyptian ship ANGELE MABRO west of Brest, France. ETO - France: The first German U-boat base in France is opened at Lorient. Germany: After spending 8 weeks in the west supervising the German offensive, a triumphant Hitler returns to Berlin and is cheered wildly by the population of Berlin. German radio stations play the song "Denn wir fahren gegen Engeland" for the first time. MTO - Libya: British warships shell the harbor at Bardia near the Egyptian border, sinking the Italian ship AXUM. East Africa: Day 27 of 537 of Italy's East African campaign in the lands south of Egypt. CBI - China: Day 1,096 of 2,987 of the 2nd Sino-Japanese War. Day 235 of 381 of the Battle of South Guangxi. South America: Day 2 of 27 of the Ecuadorian-Peruvian War, a territorial dispute between Peru and Ecuador. ETO - UK: After sundown, Luftwaffe bombers make a light attack on Great Yarmouth, Norfolk. Russian Front - Finland: Day 8 of 142 of Operation SILVER FOX, a joint German-Finnish campaign to capture the Russian port of Murmansk in the Arctic. Russian Front - Finland: Day 6 of 140 of Operation ARCTIC FOX, a joint German-Finnish campaign against Soviet Northern Front defenses at Salla, Finland. Russian Front - Finland: Day 15 of 164 of the Battle of Hanko. Russian Front: Day 15 of 167 of Germany's Operation BARBAROSSA, the invasion of the USSR. Russian Front - North: German Army Group North continues its advance toward Leningrad, reaching a line stretching from Lake Peipus through Reval to Parun (north of the Gulf of Riga). Russian Front - Center: Day 1 of 31 of the 1st Battle of Smolensk, Russia. German Army Group Centre needs to take this region before taking Moscow. Russian Front - South: Day 5 of 21 of the Battle of Bessarabia, Russia. German and Romanian troops continue their attack at Bessarabia to take the land and city that Romania was forced to cede to the USSR a year ago. Russian Front - South: In Ukraine, German Army Group South continues their drive toward southern Russia. MTO - Libya: Day 88 of 256 of the Siege of Tobruk. Axis warplanes bomb Tobruk and Sidi Barrani. Middle East: Day 29 of 37 of the Battle for Syria and Lebanon. Lt Roden Cutler wins the Victoria Cross for clearing enemy positions in Syria. East Africa: Day 392 of 537 of Italy's East African campaign in the lands south of Egypt. CBI - China: Day 1,461 of 2,987 of the 2nd Sino-Japanese War. USA: Army Lieutenant John Roosevelt Robinson (baseball legend Jackie Robinson), one of the 761st "Black Panther" Tank Battalion's few African-American officers, refuses orders to sit in the back of a military bus at fort Hood, Texas. He is subsequently court martialled, but the charges will be dropped because the order is a violation of War Department policy prohibiting racial discrimination in recreational and transportation facilities on all Army posts. 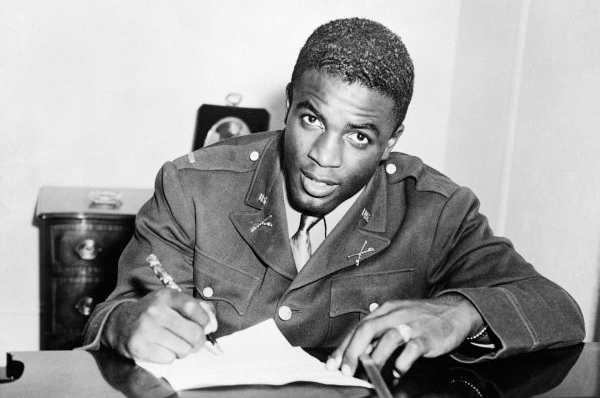 After the war, Jackie went on to break the "color line" in baseball by being the first African-American to play for the Brooklyn Dodgers. The 761st "Black Panther" Tank Battalion became the first African-American armored unit to enter combat Nov 8, 1944, during an assault on the French towns of Moyenvic and Vic-sur-Seille. The 761st Tank Battalion participated in the American counteroffensive during and after the Battle of the Bulge on Dec 31, 1945. The "Black Panthers" were able to split the German lines at three points, thereby preventing the resupply of enemy forces. Beginning on March 30, 1945, through March 23 the "Black Panthers" helped to breech the Siegfried Line, or West Wall. Lt Robinson's court-martial prevented him from going overseas and seeing action with the 761st. Atlantic: Day 10 of 14 of Germany's Hunt for Allied Convoy PQ-17. During this hunt, U-boats and the Luftwaffe will sink 24 merchant ships. Atlantic: In Canada, German sub U-132 sinks three freighters off the Gaspé Peninsula in the Gulf of St Lawrence. Caribbean: German sub U-153 is damaged during an attack made by US 6th Air Force A-20s off Panama. The submarine will be sunk next week by the destroyer USS LANDSDOWNE. ETO - UK: The British RAF Coastal Command sinks its first enemy vessel with the newly equipped Wellington bombers. ETO - Netherlands: Anne Frank and her family go into hiding in the secret annex above her father's office in an Amsterdam warehouse. Russian Front - North: Day 302 of 872 of the Siege of Leningrad. Russian Front - North: Day 63 of 658 of the Siege of the Kholm Pocket. Russian Front - Center: Day 5 of 22 of Germany's Operation SEYDLITZ, a plan to trap and capture numerous Soviet troops. Russian Front - South: Day 9 of 27 of the Battle of Voronezh, Russia. 4th Panzer Group begins closing in on Voronezh. Russian Front - South: Day 9 of 150 of Germany's CASE BLUE, the failed offensive to take the Caucasus oil fields. MTO - Egypt: Day 6 of 27 of the 1st Battle of El Alamein. The British 8th Army makes a number of attacks on German defenses, but Rommel's troops hold on. East Africa: Day 63 of 186 of the Battle of Madagascar. CBI - China: Day 1,826 of 2,987 of the 2nd Sino-Japanese War. Day 53 of 124 of Japan's Zhejiang-Jiangxi Campaign, launched to punish anyone suspected of aiding the Doolittle raiders in China. Roughly 250,000 Chinese will be killed. US 10th Air Force bombs the waterfront at Canton, marking their initial action against coastal facilities of Japanese-held Chinese ports. PTO - Alaska: Day 30 of 435 of the Battle of Kiska, Aleutian Islands. US 11th Air Force bombs targets on Kiska Island. PTO - Malaya: Day 138 of 357 of the Battle of Timor Island. Russian Front - North: Day 667 of 872 of the Siege of Leningrad. Russian Front - North: Day 428 of 658 of the Siege of the Kholm Pocket. Russian Front - Center: Day 2 of 50 of the Battle of Kursk, Russia. The Germans attack the pocket from the north and the south. Their north pincer stalls while the southern one gains about 12 miles. MTO - Italy: US 9th and 12th Air Forces bombs several targets in Sicily. CBI - China: Day 2,191 of 2,987 of the 2nd Sino-Japanese War. US 14th Air Force hits the runway at Pailochi Airfield. PTO: Day 41 of 47 adrift in a raft for the survivors of B-24 GREEN HORNET that crashed 850 miles from Hawaii. PTO - Alaska: Day 395 of 435 of the Battle of Kiska, Aleutian Islands. US 11th Air Force bombs at Main Camp on Kiska. PTO - New Guinea: Day 76 of 148 of the 2nd Battle of Lae-Salamaua. US 5th and 13th Air Forces provide air support. PTO - Solomon Islands: Day 17 of 67 of the Battle of New Georgia. US 5th and 13th Air Forces provide air support. US and Australian troops secure the bay area which will provide the Allies with a shorter supply line for the upcoming Salamaua-Lae campaign. PTO - Solomon Islands: A naval battle erupts in the Kula Gulf, north of New Georgia near Kolombangara. The US Navy loses the cruiser USS HELENA, but claims to have sunk eight or nine Japanese ships. UK: Churchill makes a statement about the Doodlebugs (V-1 rockets), saying that thus far 2,754 have been launched, causing 2,752 dead and 8,000 injured. UK: Churchill writes a secret "poison gas" memorandum asking his military chiefs to "think very seriously over this question of using poison gas." ETO - UK: Day 24 of 86 of the V-1 "Buzz Bomb" offensive on Britain. ETO - France: Day 31 of 49 of Operation OVERLORD, the Allied invasion of Normandy, France, known forever simply as D-Day. D-Day+30: Allied Air Forces provide air support. ETO - France: Day 31 of 62 of the Battle of Caen. Germany: The Germans begin transferring French and Belgian prisoners of war out of the Colditz Castle to the camp in Lübeck. Germany: The future Israeli president, Chaim Weizmann, sends a message to the British requesting that the railroads leading to Auschwitz Concentration Camp in Poland be bombed. Russian Front - Finland: Day 12 of 15 of the Battle of Tali-Ihantala. This becomes the largest battle in Scandinavian history. Russian Front - Finland: Day 16 of 50 of the Battle of Karelia. Soviet troops continue their offensive against the Finns in eastern Karelia between Lake Ladoga and Lake Onega in northern Russia. Russian Front - North: Day 156 of 191 of the Battle of the Narva Isthmus, Estonia. Both German and Soviet troops remain locked in their defensive positions. Russian Front - Center: Day 2 of 16 of the Battle of Vilnius, Lithuania. Russian Front - Center: Day 2 of 27 of the Battle of Siauliai, Lithuania. Russian Front - Center: Day 2 of 23 of the Battle of Belostock, Poland. Russian Front - South: In Ukraine, the Soviets recapture Kovel, southeast of Brest and Litovsk. MTO - Italy: Day 21 of 34 of the Battle of Ancona (north of Rome). Allied Air Forces provide air support. The US 5th Army continues clearing the Rosignano area and captures Castellina Marittima and Mount Vaso. The British 8th Army captures Osimo, 20 miles south of Ancona. MTO - Italy: Captain Franco Lucchini, Italian fighter ace with 26 victories, is shot down and killed by a Spitfire fighter over Sicily. CBI - Burma: Day 124 of 166 of the UK's Operation THURSDAY. US 10th Air Force provides air support. CBI - Burma: Day 119 of 147 of the Battle of Myitkyina. US 10th Air Force provides air support. CBI - Burma: Day 97 of 302 of the Chinese Salween Offensive. US 14th Air Force provides air support. CBI - China: Day 2,557 of 2,987 of the 2nd Sino-Japanese War. Day 81 of 259 of Japan's Operation ICHI-GO. Day 15 of 48 of the Battle of Hengyang. US 14th Air Force provides air support. The USS TANG sinks the Japanese transport DOTI MARU off Dalian. With this sinking, she obtains the record of "most total tonnage sunk" by a US submarine during one patrol. PTO - Dutch New Guinea: Day 5 of 61 of the Battle of Noemfoor. The Namber Airfield is secured by the Allies. PTO - Caroline Islands: US 7th Air Force night bombs in the Truk Atoll and again during the day. PTO - Mariana Islands: Day 22 of 25 of the Battle of Saipan. US 7th Air Force provides air support. PTO - New Guinea: Day 41 of 83 of the Battle of Biak. There are still 3,000 Japanese soldiers on the island who won't give up. PTO - New Guinea: Day 205 of 597 of the Battle of New Britain. US 13th Air Force provides air support. PTO - New Guinea: Day 76 of 481 of the Battle of Western New Guinea. 5th Air Force provides air support. PTO - New Guinea: Day 23 of 80 of the Battle of Lone Tree Hill. PTO - Solomon Islands: Day 249 of 295 of the Battle of the Bougainville Islands. US 13th Air Force provides air support. Norway: With over 800 Norwegians still held in Japanese prisoner of war camps, Norway declares war on Japan. CBI: US 14th Air Force attacks targets in French Indochina and in China. CBI - China: Day 2,922 of 2,987 of the 2nd Sino-Japanese War. PTO - Borneo: Day 27 of 67 of the Battle of North Borneo. US 5th and 13th Air Forces provide air support. PTO - Dutch East Indies: Day 6 of 21 of the 2nd Battle of Balikpapan. PTO - Japan: US 20th Air Force B-29s drop incendiary bombs on the urban areas of Chiba, Akashi, Shimizu and Kofu. PTO - New Guinea: Day 557 of 597 of the Battle of New Britain. US 10th Air Force provides air support. PTO - New Guinea: Day 441 of 481 of the Battle of Western New Guinea. US 10th Air Force provides air support. PTO - Philippines: Day 259 of 299 of the 2nd Battle of the Philippines, aka the Liberation of the Philippines or the Philippines Campaign. PTO - Philippines: Day 204 of 244 of the Battle of Luzon. The battle is said to over but hold-outs will continue fighting until the end of the war. PTO - Philippines: Day 119 of 159 of the Battle of Mindanao Island. The battle is said to over but hold-outs will continue fighting until the end of the war. PTO - Philippines: Day 111 of 135 of the Battle of the Visayas region. The battle is said to over but hold-outs will continue fighting for several weeks. USSR: The AK-47 assault rifle enters into production in the Soviet Union. On the battlefields of WWII, the men of the African-American 761st Tank Battalion under General Patton broke through enemy lines with the same courage with which they broke down the racist limitations set upon them by others -- proving themselves as tough, reliable, and determined to fight as any tank unit in combat. A photographic history of life as soldier on a US airbase in the UK during WWII, as seen through the camera lenses of the GIs themselves.